At the beginning of 2014, Ellie and I applied to be on a brand new show called Crafty Beggars. 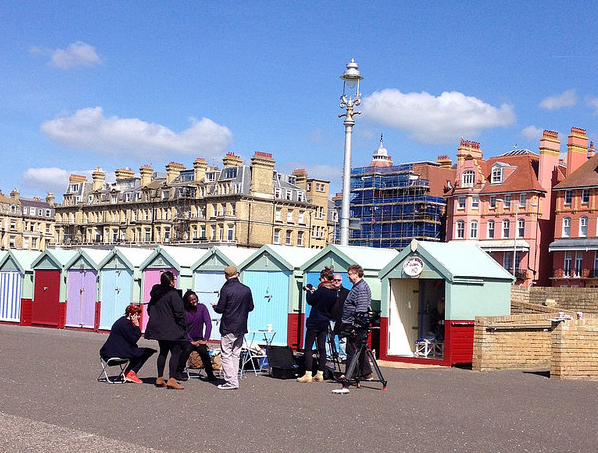 We were successful at getting on the show and filmed our episode over the May bank holiday weekend. It was 2 long days of filming but loads of fun. It was really interesting to see how things worked from behind the scenes and how the show was put together. 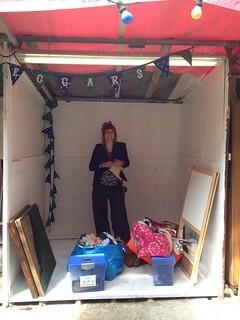 The first day was spent running around Brighton buying, begging and borrowing items to make our wares. 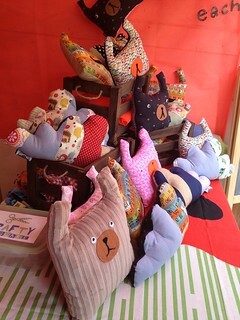 We worked well into the night so that our cloud cushions and bears could be sold the next day in a market. Then we were up early on the sunday to set up our stall and get selling. 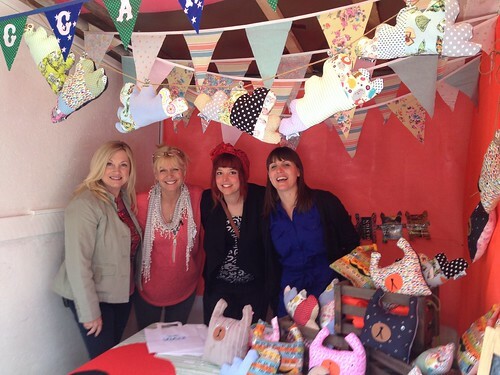 Here we are with the presenters Wendy and Julie on our stall. Find out if we won by watching the full episode here. I have finally got around to making something to wear. 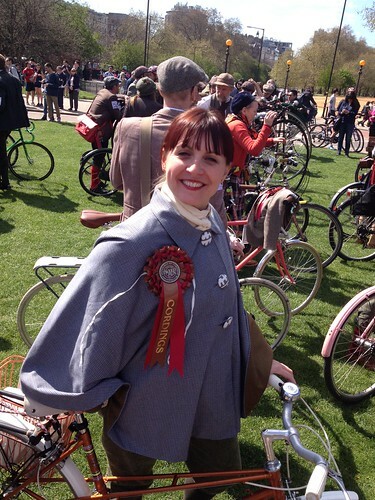 It’s something i’ve been meaning to do for a while and the Tweed Run gave me a great excuse to go for it. 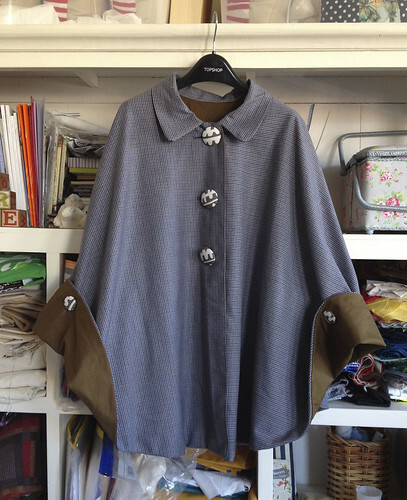 I made a cloak based on a DIY Couture book. 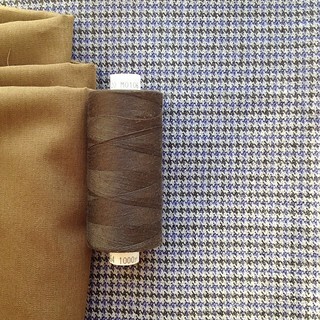 The outside of the cloak was a blue and green tweed with a green lining. 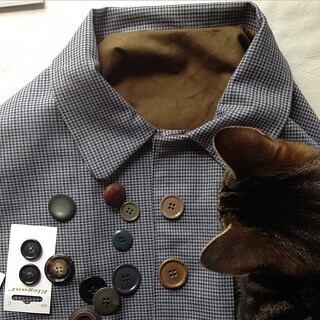 I covered my own buttons and buttoned the sides to make it a little bit easier to cycle with. 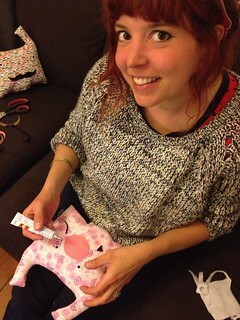 And here’s a picture of me wearing it! Tally-Ho! I met the lovely people from Jude’s Ice Cream at a Innocent Creative evening back in November 2013. Then fast forward a few months and they approached me to make a very special ice cream cosy for their favourite flavour. I love a new challenge and this was no exception. 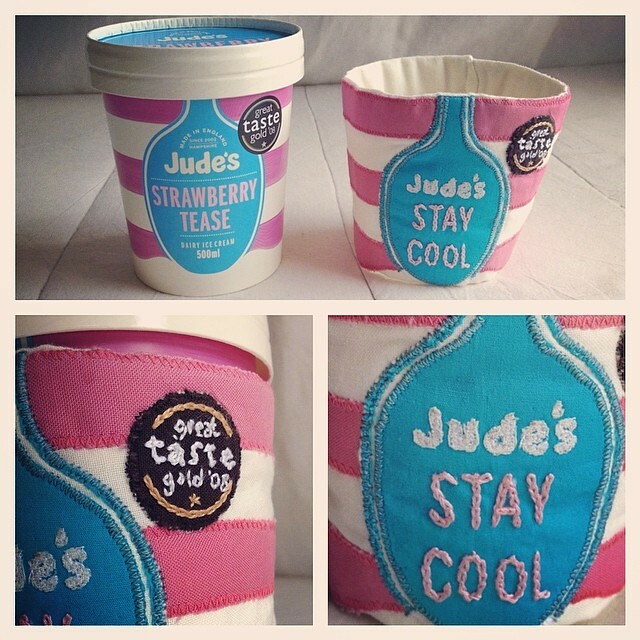 I think that Jude’s are on to something and maybe ice cream cosies are the future. You heard it here first! The full blog post from Jude’s can be found here! I’m very excited as I write this post as I have a little announcement! I will be guest tutor, hosting my own mini workshop on the 14th October, from 8.30 to 10.30pm, for the wonderful and contemporary Craft Guerrilla group who are based in Walthamstow, East London. 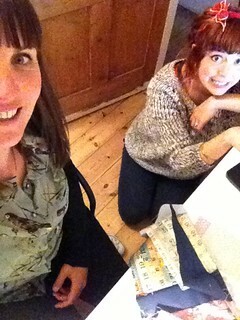 The venue is ‘Ye Old Rose and Crown’ and I will teaching how to make this pretty, personalised envelope bag. Using several different stitches including blanket stitch and chain stitch, you’ll work from a basic pattern, which can be used and adapted again and again. 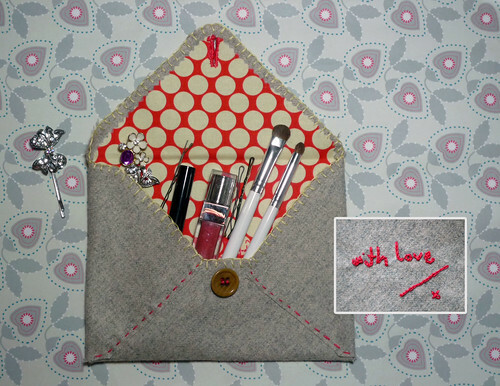 The button closure gives the bag a tidy outer finish, perfect for storing things or even as a special gift! All materials will be included in the £10 fee. If you fancy giving it a go, please email sophwalker@gmail.com to book your place and for Paypal details. Please note all fees are non-returnable. So I thought i’d play a little catch-up. I made this peg bag back in January 2009. A quick, simple bag which is stripy on the back and spotty on the front, oh and with a couple of flamingos stitched onto the front. It was so good, i ended up making my Dad one too!